Posted in entrees, Middle Eastern, recipe, savory by Antonio Tahhan on April 27th, 2010. You can follow any responses to this entry through the RSS 2.0 feed. You can leave a response, or trackback from your own site. Wowie what a post !!! I’m making these, and I’m so sure it’ll be such a hit at home …. thanks to you, now I have a new addition to my Lebanese recipes … !! !We have to get together n cook honey !!!!! BTW I hope you are feeling better, I’ve been under the weather too past whole week .. sigh … inshallah will be better soon. I’m really excited about making these. Hi Anne! Thanks for the comment! 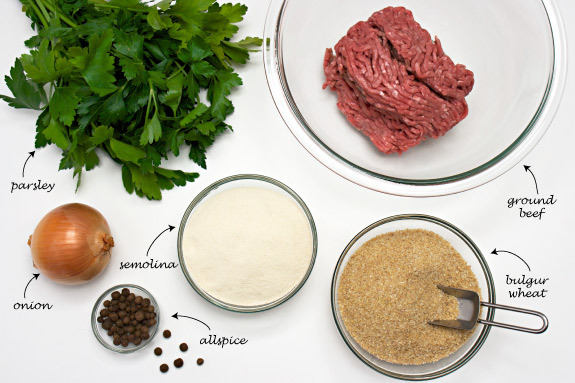 I googled “İçli Köfte” — it reminds me a lot of كبة طرابلسية (literally translated kibbeh from Tripoli). 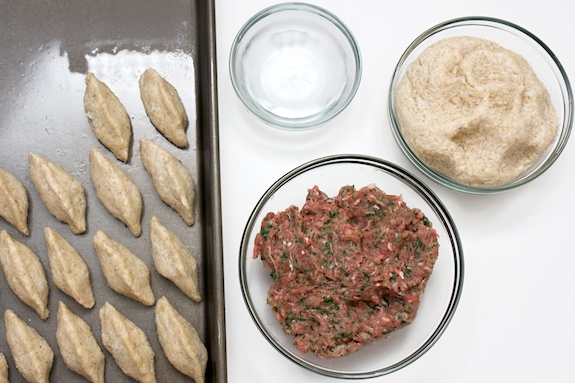 These kibbeh are filled with cooked ground beef and are also fried like the Turkish İçli Köfte. It’s one of my favorite dishes 😀 I also found this Turkish food blog that steams the İçli Köfte, similar to the Kbeibat dumplings, and then pan fries them. My grandmother likes to do this with the left over Kbeibat for a slightly crisp exterior. The similarities make sense since Aleppo, Syria (where my family is from) is only about an hour from Turkey’s southern border. Thanks for sharing! Thanks Kajal! I’m feeling a lot better now — thank you!! I agree, we have to get together at some point. I can picture it already: a huge feast with lots of Indian and Mediterranean flavors 😀 enjoy the dumplings!! Oh man! Sorry to hear that. I hope you’re completely over it (I mean, with it being, er, Spring and all). I’ve never heard of these before but I’m naturally drawn to dumplings (Asian heritage, lol). They look really good! Your kbeibat look so good! 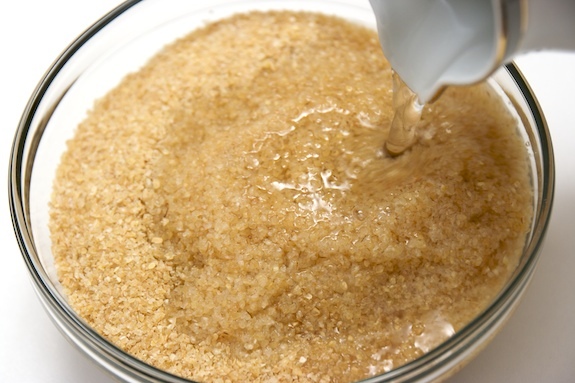 I’m not used to seeing bulgur in anything but grain form, this looks like a fun recipe to try a new ingredient in. Isn’t it interesting that dumplings, in pretty much any cooking kingdom, are always tasty? Hurray for dumplings! I have never had these ; must be a Syrian specialty. Looks mighty good; any kind of kibbe is good in my book! This is a real Assyrian Kebbeh, I did a posting about it last month too… INTA SYRIANEH????? I am glad to see more people share and enjoy my food. Solo espero que pueda encontrar los ingredientes en Okinawa, jaja. These are Assyrian dumplings we call “koutleh”. They were first only known by the Assyrians in the Tur Abdin(Mountain of the servants God).That is right at the border with Syria. Kamishli is a town founded by Assyrians who fled in 1915 for the turks and koerds. Also a lot of refugees came to Allepo. And with them they brought their food. There is also a version of this from Diyarbakir. 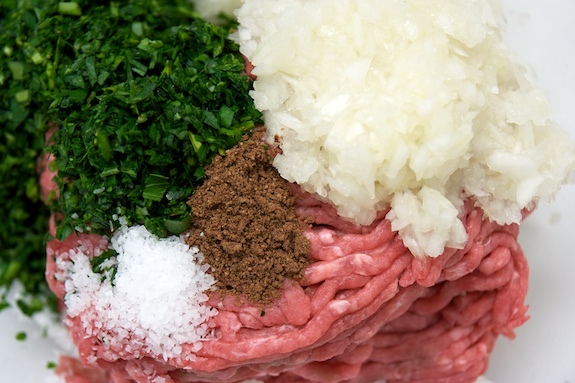 Then you put very finely ground meat through the dough. Nice blog! Just to finish what others said about the dumplings. 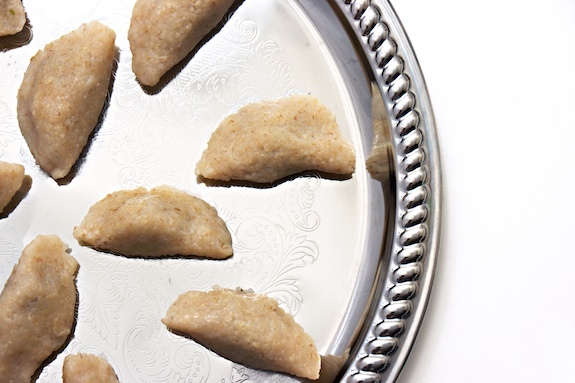 These are indeed Assyrian dumplings,our delicious koutleh. And for a first time not bad. But before you can make them like the Assyrian grandmothers do,you’ll need a lot of practice. These are notouriosly difficult to make.Assyrian women make the dough very thin,before filling them.And the women who can make the koutleh like that,have a special place in the family and the community. And the women that can’t make them so good are always embarresed when asked about their koutleh-making skills. So important are these dumplings in our culture! Keep up the good work, and looking forward for more recipes. I kind of know what you mean … my little guy (he’s just 3) suffered nearly 3 weeks with horrible allergies (tree pollen is his nemesis). And now both kids have been sick (or possibly affected by allergies) for six weeks on and off. It’s awful!! Now, as for these little dumplings … they sound superb. Great recipe! Wonderful post. I love the use of bulgur in a dumpling. 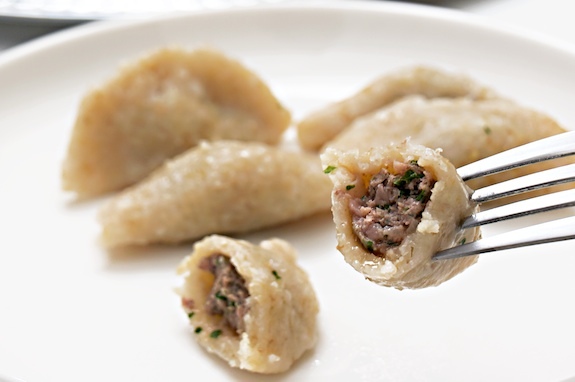 Do you know the origins of these dumplings? Well,the origin of this dumplings is Assyrian. Maybe you’re not aware of it,but there are still Assyrians in the Middle East.These dumplings only represent a small but important part of Assyrian cuisine and culture.Maybe a mayority are now arabs but for the arabs a different Middle-East existed for 5000 years.And the culture didn’t die, much of it was absorbed by the arabs who then added their own flavor to it. But the ancient people of the Middle-East may not be forgotten,because they are the founders of the Middle-Eastern food and culture. Hi there. Just found your blog for the first time via Lottie+Doof on Twitter. 🙂 These dumplings look really good – I’ve never heard of making dough from bulgar wheat. Nice! i have been reading all the comments on the kbabath i have been making them all my life we have a large community of mardennia in boston area i love the idea all the people that are involved in cooking ,that is my favorite thing to do .I am very happy to meet all of you. can these be fried as well? Zeki: Yes, the leftovers can be fried. 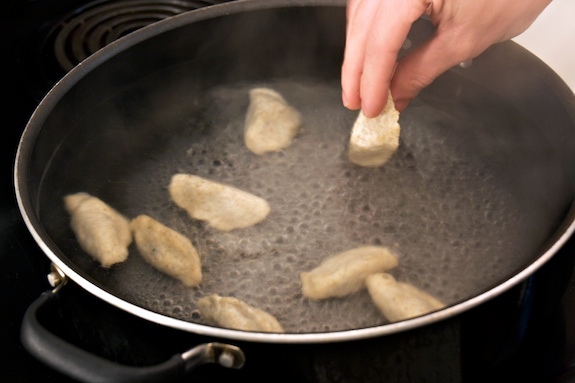 Instead of heating them up in the microwave, families will dip leftover dumplings (which were originally boiled) in egg and pan fry them. This gives them a crispy crust that is absolutely delicious! I posted some photos of the fried kbeibat on my Facebook. just saw your facebook pics of them..they look delicious..must try this!! This origin from Kbeibat Is assyrian. Traditional in southern Turkey. Adn traditional in mi family from Mardin. Dear all, I love these “ketal”. When made proper they are super delish and healthy. But I would like to point out that the dish is Syriac NOT Assyrian. Assyrian means “Ashoori”. and it is not an Ashoori dish, it is a Syriac or Syriani dish.